Silently watching countless Siberian cranes flapping their wings, the soft gurgling of waves at River Ganges or the subdued chanting of religious mantras by the priests—Allahabad has its own tasteful charm. Lauded for being the ‘literary heartland of India’, Allahabad Travel is a sought after for religious tourism, bird-watching, sporting and cultural events. And who doesn’t know the importance of Kumbh Mela, the massive Hindu pilgrimage, celebrated in Allahabad once in every 12 years? Phenomena, indeed it is. Originally called as ‘Prayag’, Allahabad—the second oldest city in India—is located at the confluence of River Ganga, Yamuna and mythical Sarasvati. This confluence, known as Triveni Sangam, is frequently visited by foreign tourists, hailing from different parts of the world, searching for salvation and peace. Surprising its admirers with interesting facts, this largest city of Uttar Pradesh, had even been the capital of India for a day. Even Hiuen Tsang, the famous Chinese Buddhist monk, had visited Allahabad during the 7th century, beautifully describing the beauty of Allahabad trip in his travelogues. History of Allahabad reveals its pivotal role played even during the times of Vedic era, when Lord Brahma—the Hindu God of Creation—had offered his first sacrifice. The administration of Mauryan, Gupta, Kushan and Kannauj Empire left its indelible marks on Allahabad’s architecture, culture and traditions. The growth of Indo-Islamic and Indo-Saracenic architecture bloomed during the age of Delhi Sultanate, especially during Mughal Emperor Akbar’s rule. Later, Allahabad evolved as the ‘nodal point for Indian revolutionaries’ during the freedom struggle. It witnessed the colonial rule for 150 years, eventually being the starting point of Quit India Movement in 1920s. Interestingly, Allahabad had produced the largest number of Prime Ministers in Indian history, revealing its administrative potential. At the same time, this city gave birth to India’s most famous Hindi poets/authors like Mahadevi Verma, Munshi Premchand, Shubhadra Kumari Chauhan and Suryakant Tripathi Nirala. Thus, the list goes on and on. 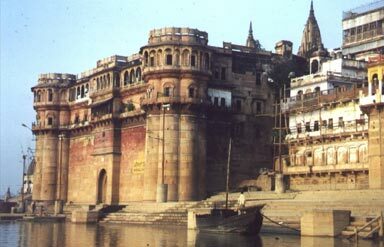 So, come and experience the beauty of Allahabad Trip, in the way you can feel and experience. Your journey would be different and for sure, remarkable in its own way, with India touching your soul, silently. Popularly called as ‘Sangam,’ it is basically the confluence of three rivers-Ganga, Yamuna and Saraswati. It is the venue for the famous Maha Kumbh Mela that takes place once in every 12 years. 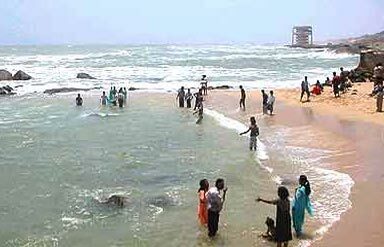 The water of Sangam is considered sacred and Hindus from all over the world come to take a holy dip in it to cleanse their sins. Pilgrims hire a boat to reach the mesmerising convergence of water from river Ganges and Yamuna. During winters, colourful migratory birds fly down to Sangam from Central Asia and other parts of the world. Some of the common aerial visitors are Ruddy Shelduck, Cotton Teal, Cattle Egret and Gadwall. Located on the eastern bank of River Yamuna, this impressive fort is a splendid example of Indian craftsmanship. It was constructed by Emperor Akbar during 1583 A.D. There are three entrances to the fort and it is fenced by 7m wall on all sides. The entrance on the eastern wall will lead you to an underground temple called Patalpuri. It is one of the oldest temples in the city and it is presumed that Lord Rama had also visited it. It is a massive garden sited close to the Allahabad Junction. Huge walls surround the garden which contains the tombs of Khusrau Mirza, his mother Shah Begum and sister Sultan Nithar Begum. Khusrau was the eldest son of Mughal Emperor Jahangir. 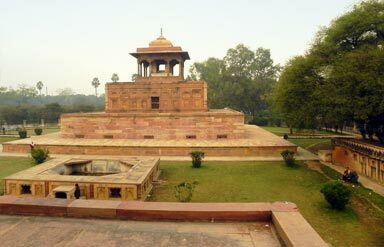 The three mausoleums reflect a classic example of Mughal architecture. Exquisitely carved entrances, large chhatris and artistic designs etched on the walls look amazing. The tombs are made of sandstone. It is a national level museum erected in 1931 under the supervision of Allahabad Municipality. Its foundation stone was laid by Pandit Jawaharlal Nehru. Later in 1986, the Ministry of Culture asked the Allahabad Museum Society to take care of it. Sculptures, terracotta artefacts, findings of Indus Valley, bronze seals and coins are put on display in the museum. Miniature paintings, documents in Sanskrit and various other antiquities can also be spotted in the museum. Now called as Chandra Shekhar Azad Park, it is a public park covering an area of 133acres and was carved out in 1870 to commemorate the visit of Prince Alfred. It boasts of being the biggest park in Allahabad. A memorial stands at the exact point where the brave freedom fighter Chandra Shekar Azad had sacrificed his life in 1931. It also flaunts an Italian limestone-made canopy built by Sir James Digges La Touche in 1906. Jhusi(9km), Bhita(22km), Tons River Aqueduct(43km), Upardaha Lake(44km) and Kara(69km) are some of the ideal escapes included in Allahabad Travel Guide. This is the perfect place to shop for devotional objects. Shoppers can purchase incense sticks, holy books, and idols of deities, good quality of camphor and other similar items. Bibliophiles are sure to fall in love with the amazing collection of novels and fictions. Jewelleries and handicraft items are also very famous. October-March is an ideal time to take the trip to Allahabad. Magh Mela or Mini Kumbh Mela (January) is an annual festival when the entire city rejoices in a festive mood. Air: Bamrauli Airport (18km) is the nearest airport to the city. There are several other operational aerodromes as well like in Varanasi and Kanpur..
Rail: Allahabad Junction is an important railhead in North India and links to almost all the major Indian cities. Road: State-owned buses run from nearby cities like Jhansi and Gorakhpur for the destination. It is also connected by distant cities like New Delhi and Bhopal via road. 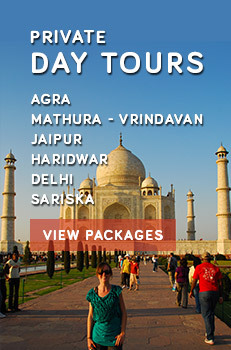 So, come and enjoy what Allahabad Trip means for you, in your own distinct manner. Let the breathtakingly beautiful charm of the city intoxicate you.